As the United States prepares plans to downsize its military, the Navy is set to order fewer Lockheed Martin Corp F-35 fighter jets than previously expected over the next five years. Citing an unnamed defense official, Reuters reported that beginning in the 2015 fiscal year, the Navy will request the purchase of 36 F-35C fighter jets, which are designed to land on aircraft carriers. That’s nearly half as many as the 69 originally projected. The Air Force, meanwhile, is postponing its own request for four F-35A jets for one year. Beginning in 2016, however, it remains on track to move forward with its purchases as planned, an arrangement that will see the Air Force purchase about 238 jets total. The Marine Corps stands out as the sole player committed to its original plan, still expected to request 69 F-35B jets over five years. These are scheduled to be combat ready and in use by mid-2015. According to Pentagon Comptroller Robert Hale, the move to purchase fewer jets does not indicate that the military is underwhelmed with the jet’s performance capability, but rather it was based primarily on budgetary considerations. 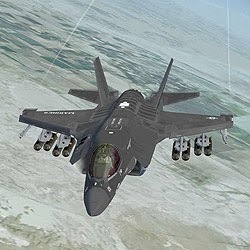 Defense officials told Reuters that the plan is still to purchase a total of 2,443 F-35s over the next few years. Other performance and manufacturing setbacks have also hobbled the program as it unfolded. Last year, a Pentagon report found issues with the jet’s internal software, while leaked budget review documents suggested some within the government would consider cancelling the project. Still, the military has continued to reiterate its confidence in the program’s ultimate success. "The basic design of the F-35 is sound, and test results underscore our confidence in the ultimate performance that the United States and its international partners and allies value so highly," Air Force Lieutenant General Chris Bogdan, who heads the F-35 project, said last year. "Of course, we recognize risks still exist in the program, but they are understood and manageable." The decision to purchase fewer jets also comes amid reports that Defense Secretary Chuck Hagel is planning an overhaul of the US armed forces in order to fulfill President Obama’s goals of scaling back overseas military operations while remaining capable of waging war when necessary. Under Hagel’s proposal, US troop levels would fall somewhere between 440,000 and 450,000, the lowest level scene since World War II. According to Reuters, the sequester could also come back to affect the F-35 project. Just last week, Hagel said that if Congress does not revoke or somehow deal with the automatic cuts scheduled for the 2016 fiscal year even fewer jets may be bought. Topics: F-35 Fighter jet International U.S.